The zip code with the largest year-on-year change is located in Hinesville, Georgia. Not surprisingly, further analysis of pricing activity in this area shows pricing volatility over 19 percent for 4 out of the 11 stores in this zip code. Pricing volatility is a measurement pricing activity (rate increase, decrease, addition or removal) within a time range. Higher pricing volatility is typically an indication of operators responding to higher market demand by adjusting their rates more frequently. In this analysis, 6 out of the top 20 zip codes are located in the state of Florida. Many cities in Florida have undergone rapid growth (both economically and in population). 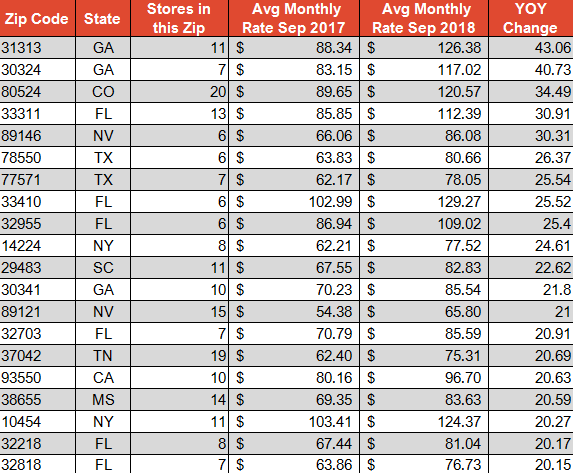 Florida is also one of the states with the highest number of new self-storage developments in the last couple of years. Not surprisingly, the year-on-year rate changes for this unit type reflect the response of owners and operators to an increasingly competitive market in Florida.